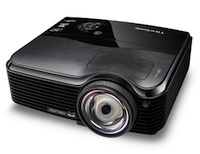 At the InfoComm 2010 conference in Las Vegas, ViewSonic introduced two high-brightness projectors, one 3D-ready short throw projector, and a projector that functions as an interactive whiteboard ... minus the whiteboard. The two high brightness projectors, the Pro8450w and the Pro8500, are the newest models in the pro 8 series projector line. The Pro8450w is a WXGA installation projector that offers a brightness of 4,500 lumens, while the Pro8500 is an XGA installation unit that has a brightness of 5,000 lumens. Both models come equipped with Crestron RoomView Express software and have the ability to handle networked IP presentations with multi-user capabilities. Other shared features include a maximum image size of 300 inches and a 1.5x optical zoom. The 3D-ready, DLP-based short-throw projector, dubbed PJD7382, has an image size of 80 inches at a distance about 3 feet. It offers a 1,025 x 768 native resolution, a 3,000:1 contrast ratio, and a brightness of 2,500 lumens. Other features include RJ-45 connectivity, 10 watt speakers, and a microphone input. The other projector that ViewSonic introduced at the conference was the PJD7383i. This model uses an interactive pen that writes on most surfaces to allow educators and students to interact with content in a way that's similar to the way they'd interact with a traditional whiteboard. The projector features a built-in split screen option that allows up to four people to use the projector's white board qualities at the same time. Other features of the PJD7383i include a computer-free function that lets users run presentations from a USB drive; a 1,024 x 768 resolution; a brightness of 2,500 lumens; a throw ratio of 0.61:1; and compatibility with both PowerPoint and WebEx software. ViewSonic is showing its new technologies at InfoComm 2010 in booth N2375.